Braised beef in Bangkok can span from the most boring bowls to a fabulous party for your taste buds. Nuea Toon Nang Loeng at the Nang Loeng market will make you smile. The owner is charming and makes everybody comfortable in a pleasant atmosphere. 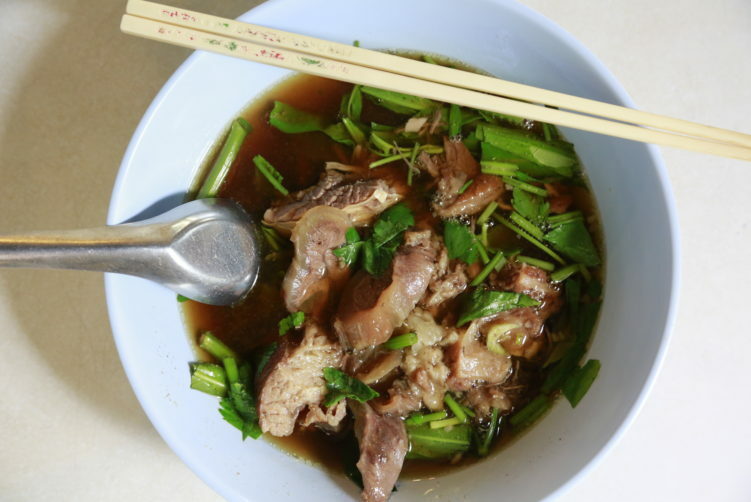 Nuea Toon Nang Loeng is currently run by third generation and you will be thinking that the broth must have simmered for just as long as the shop when tasting it. Nuea Toon Nang Loeng is a cosy open corner shop 30 meters outside of the main market area. It’s a popular spot for locals so it can be a small wait to get served, especially during the main lunch hour. They have tables both outside and inside so if full, a few minutes of patience will serve you well. The beef is braised for hours and the broth is packed with aroma – including the taste of herbs. Not to forget the meatballs. You can choose to have the beef with noodles or steamed rice. Personally I prefer steamed rice her in order to soak up all those lovely flavors from the broth. Some bites might have a little fat on them, but it is easy to separate the fat from the meat in case you prefer plain meat. At Nang Loeng market you don’t risk meeting anyone from your neighborhood back home. 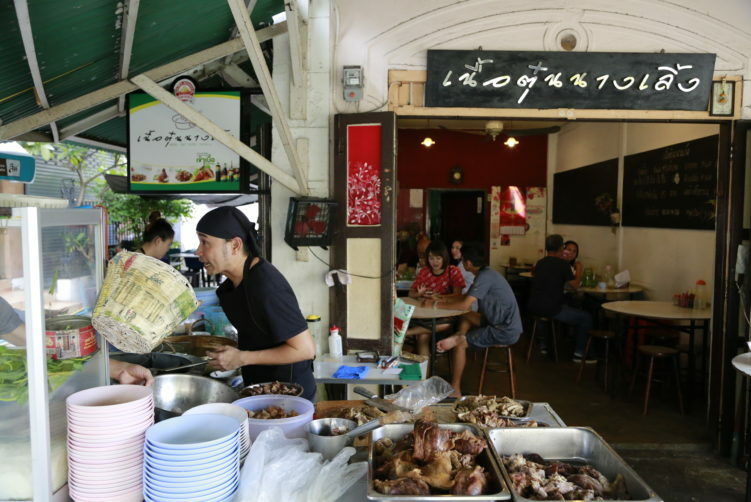 It is one of the best kept secrets in Bangkok for food, with locals completely dominating the scene. The market dates back to 1899, but still offers a glimpse into the old style Bangkok. The market is both a fresh market and a food court with plenty of vendors serving ready to eat food. Nang Loeng market have plenty of vendors serving delicious food so show up hungry. Be aware that the market closes 2:30 pm and that many vendors are sold out if you show up late. My advice is to skip your hotel breakfast and to eat at the market. The Nang Loeng market is also renowned for Thai sweets. It is a much more accessible area than most visitors think, and you get a short 10 minute canal trip as a bonus. See my article on beating the Bangkok traffic with canal taxi for more information on canal taxi. Nuea Toon Nang Loeng is a charming and nice spot for a sit down. There is no air conditioning, but that is not really needed as it is a corner house with shadow available most of the time. It is one of my favorite spots in the Nang Loeng Market area, just my thing with great atmosphere and great food. The service is friendly and the atmosphere relaxing. Like many street food stalls, it’s miles ahead of any white linen spots when it comes to taste. I have actually also brought with me take away food from other vendors at the market and they have always been helpful to give me a bowl or plate as long as I have ordered food from them as well. One of the other must visits at Nang Loeng Market is Mae Lek (only take away) with her Sai Krok Pla Naem that consists of consists of rice and sausage, snake head fish crumble with some herbs, garlic and crushed peanuts, a couple of small chilies and leaves of salad to pack it all inn. It is an institution in this part of town. A fifteen minutes walk back the same way, but instead of entering the taxi canal area, you continue along Maha Chai road where you find some great street food in Bangkok. 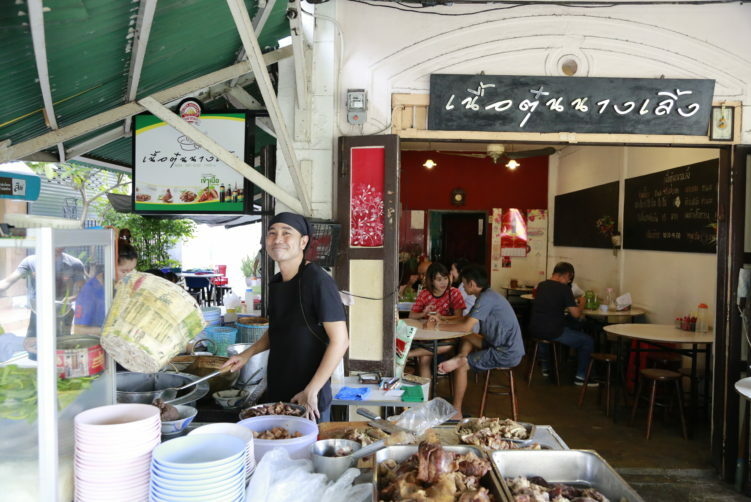 This includes Jay Fai with her Michelin Star and the famous Thip Samai (pad thai) in addition to one of the more inventive spots for Yen Ta Fo in all of Bangkok. Open:Mon – Sat 9.30am – 2.30 pm. Closed Sundays. How to get there: Nang Loeng market is located north of Banglamphu, so no BTS or MRT here. Canal taxi or ordinary taxi in addition walking are your options. If you go by ordinary taxi, be ready to show the driver the address on the map. If you’re down-town and close to Saen Saep canal, an option is to use the canals and take the boat taxi to Panfa Leelard pier (end pier) – takes about 7-8 minutes from Hua Chang pier (Ratchatewi), then 7-8 minutes of walking to the Nang Loeng Market. Buss is of course always an alternative, but might take some time. Number 5, 10, 53 or 171 will take you there. If you come by car you can take Lan Luang road from the Yomaraj Intersection – cross the overpass when you pass Mahanak market and turn right onto Krungkasame Road. At Thewakam intersection, you will find the Nang Loeng Market on your right. If you find yourself in Ratchadamnoen Avenue, head in the direction of Nang Loeng. The market will be on your right.